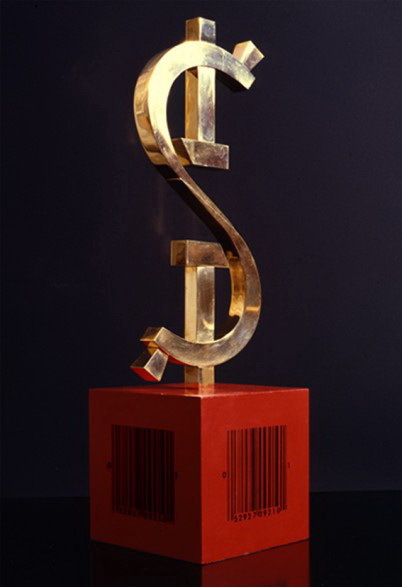 “Lamm’s sculpture Dollar (1990–93) would feature a gold-painted version of the dollar sign whose two curves have been altered to become inverted hammer and sickles, symbol of the old Soviet Union. The sculpture rises above a red cube whose sides are ornamented with bar codes. Hence the work sardonically celebrates the replacement of the ideology of communism by that of capitalism in the new Russia, while also noting the new rapprochement between Russia and America through the medium of the dollar. Placed, as it would be, in the kind of site that once contained monumental sculptures of heroic workers or other heroes of the old regime, it symbolizes the ultimate triumph of American-style capitalism”, - Eleanor Heartney, Editor contributor for Art in America, independent art critic.